As we head towards another year of our Sydney to the Hunter Cycling Classic wanted to launch an ideas window for our riding community. 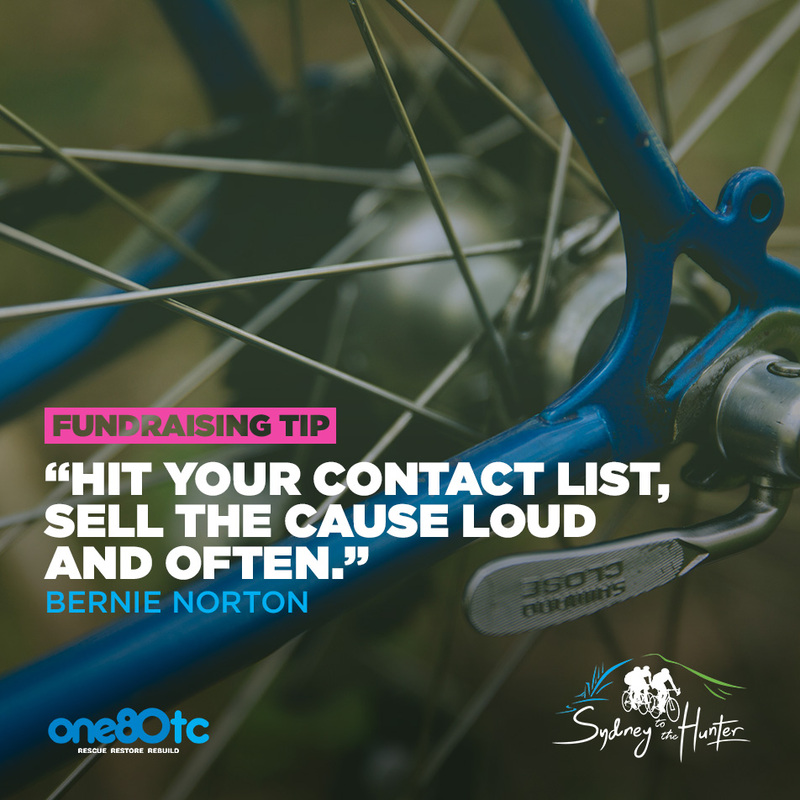 Check out the list below for something to ignite your fundraising efforts. Let's start with something simple, I am sure this is not groundbreaking but here are some tips from our team. Sending an email may get some response, but personal contact is always the most productive. Most of our long term riders agree that it may take a few phone calls to encourage your supporters to make the donation. The same principal goes for social media sharing, even if friends like your post, comment, share it, you may still need to get in touch the "old fashioned" way with a phone call or face to face to tell them why you are riding and supporting ONE80TC. 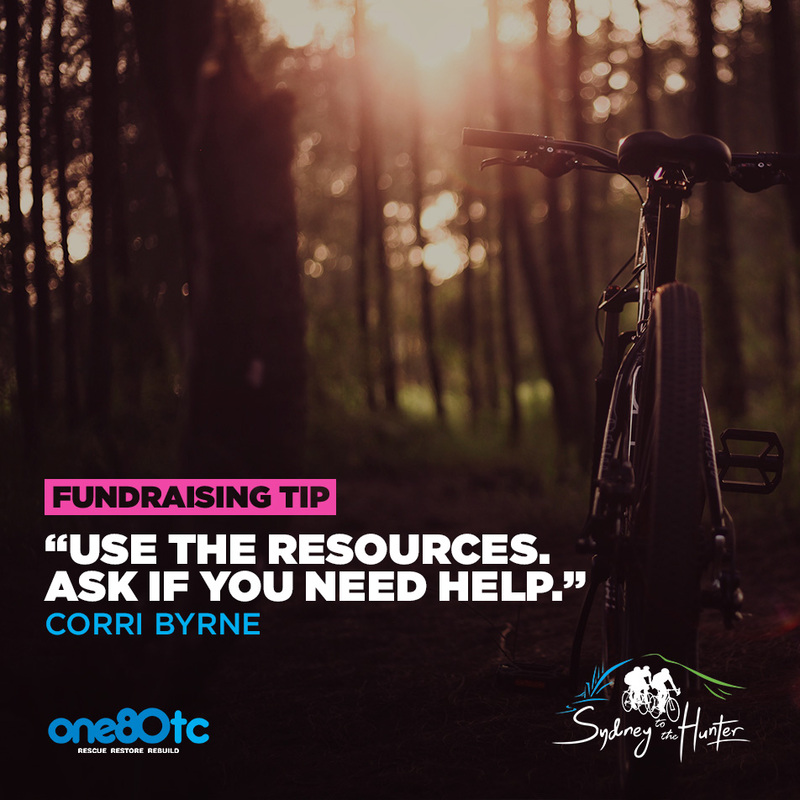 There are so many different ways to fundraise, whether you have a bake sale, a battle of the bands, host a trivia night or more, the key to success is not doing it all alone! For some raising money through their networks is a daunting task, in fact the 200 km ride seems simple in comparison. If hosting a fundraising event is outside your comfort zone, then empower people around you to support. Maybe it's your partner or work colleagues, it could even be other riders? Some of the best fundraising efforts have come through collaborative efforts of teams or groups of riders working together. Putting on a trivia night complete with auction or raffle items is a big job for someone alone, but many hands make light work! Car wash, lawn mowing, odd jobs, slave for a day! Fundraising can be hard work, especially if you don't really embrace what you are doing. The Sydney to the Hunter Cycling Classic is a fantastic event, where riders are treated like royalty and we seek to honour the efforts made through hours of training and, ultimately, the challenge of the ride. But the Sydney to the Hunter Cycling Classic is our Ride for Hope - hope that we can transform another life, turning someone from a life of addiction to restoring family and community ties. ONE80TC are an organisation committed to turning lives around and it is only through your support that we can continue these efforts. Thank you for all your support and thank you for taking up the challenge, both of riding and raising! If you have access to a business network there may be an opportunity to explore sponsorship. One rider this year has worked closely with suppliers and clients seeking sponsorship. His pitch to suppliers is around historical spend - over the years we have invested $x would you consider supporting me on this charity ride. To clients he has offered product discounts or similar for their donation. Many larger corporates also have foundations or grants that can be applied for, some may even offer matched giving. At the end of the day, it is all about asking and presenting an opportunity to support a worthwihle cause through a tax deductible donation. One of our fundraisers last year raised over $7,500 from 75 unique sponsors, 65 of them gave $100 or less. At the end of the day your target can be reached any number of ways, whether a whizz bang event or many of your friends and family offering support. Maybe you could ask for $1 per km? Or even $1 per 10 km? The encouragement is to start early, so that it doesn't get stressful in the final few weeks. There are numerous posts, videos, brochures, stories, reports available to help support our fundraisers. At the end of the day, if you are not sure ... ask! Check out our YouTube channel for video testimonies, our Facebook feed for student updates and keep an eye on weekly email updates for tips. Every dollar counts and every dollar has an impact on the lives of young men and women hoping to turn their lives around.